Traditional Desk Chairs for the discreet individual. 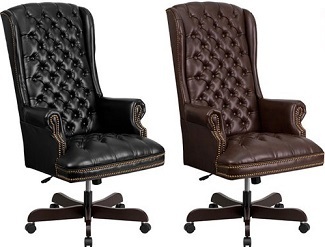 Traditional desk chairs are the ultimate in luxurious office furniture. If you have to sit at a desk all day, why not cradle your body in supple, top-grain leather? 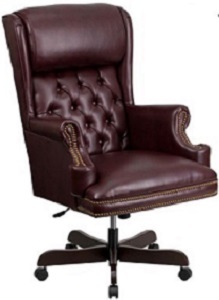 Many law offices and other high-profile businesses choose traditional desk chairs. Leather will impress your clients and visitors, as it shows confidence, competence and stability. And why stop there? Traditional guest and reception chairs to match your office's style creates a uniformed environment that conveys class and success. 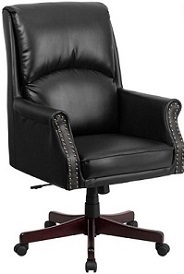 At Office-Chairs-Discount.com you will find more than the standard traditional desk chair. Many desk chairs that are otherwise covered in fabric can be custom ordered with leather upholstery instead. We give you many choices when it comes to the type and grade of fabric you choose for your furnishings. From low to high rub factor fabric, to varying grades of leather, you can design a chair to complement your d�cor and reflect your personality. 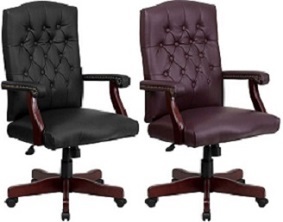 Office-Chairs-Discount.com offers more than traditional desk chairs. We are your complete source for commercial grade office furniture. The durability and style of our furniture cannot be beat, and neither can our discount prices. 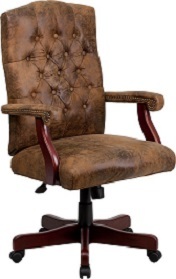 Browse our online catalog now, or feel free to contact us anytime for your traditional executive leather desk chair needs.